I usually read your blog, thank you very much for keeping it. 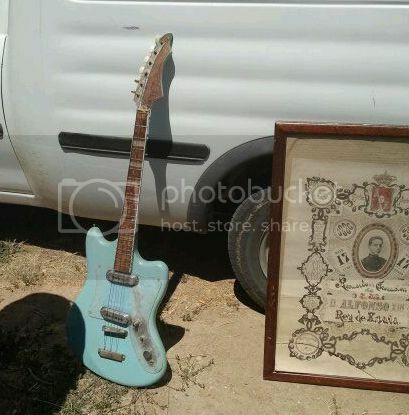 Last sunday I found this guitar on a flea market near Madrid, Spain. I've been searching the net but could not find any information about a similar model. It seems Italian but is too classic for this. German? Could you help me find the brand and model? I will readily admit that it's not a guitar that I recognise, and without trawling through each and every guitar on Fetish Guitars, Cheesy Guitars and other similarly fascinating websites, I don't think I can put a name to it. I suggest you use those sites as a starting point in your search. I would do so myself, only once I start looking at one of those sites that's the whole day gone and I have a busy week ahead of me and simply can't afford the time. Of course if any of our helpful readers recognize the guitar, perhaps they could let us know via the comments below! I agree, it does look Italian in style, but then things like the neck with its Hofner-like block position markers and the type of pickups used do look a bit Musisma/Migma-like, so maybe it is German. Labels: cool guitars, German guitars, vintage guitars, What's that guitar? A West-German Klira body (contour, pickups and scratchplate are telltale), but probably a replacement neck with block inlays and a more angular headstock (my guess is a Hofner). Quite possibly an Ottwin. The hardware is quite primitive as is the weird headstock shape.